Six new ultra-compact mini PCs with M.2 SSD, DDR4 RAM, 7th generation U-class Intel processors, HD Graphics 620, and HDMI 2.0 shipping soon. Outside of the usual motherboards and notebooks for gaming enthusiasts, Gigabyte also offers a line of mini PCs called Brix. The series targets both mainstream users with low processor demands and power users with the Brix Gaming lineup complete with Nvidia GeForce GPU options. The latest announcement from the Taiwanese manufacturer is a refresh of the core Brix models with the latest ULV Kaby Lake processors. Gigabyte is promising a 10 percent increase in GPU power compared to Skylake with improved HEVC hardware acceleration for better 4K video playback. This is accompanied by an updated HDMI 2.0 port for outputting up to native 4K at 60 FPS on supported external monitors compared to just 4K at 30 FPS on older HDMI 1.4 ports. A total of six new SKUs have been unveiled including the GB-BKi3A-7100, GB-BKi5A-7200 , GB-BKi7A-7500 , GB-BKi3HA-7100, GB-BKi5HA-7200, and GB-BKi7HA-7500. Unfortunately, the Brix Gaming and Brix Pro families have not been updated with new Kaby Lake or even Pascal processors and are still shipping with Skylake and mid-range Maxwell options. 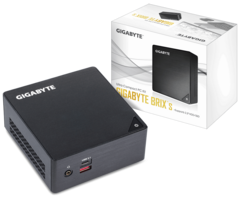 Gigabyte may be waiting for gaming-appropriate Kaby Lake and Pascal options such as the Kaby Lake HQ series or the rumored GTX 1050 before refreshing the rest of the Brix series. The new Brix mini PCs should be available very soon according to the press release, albeit no prices have been announced.